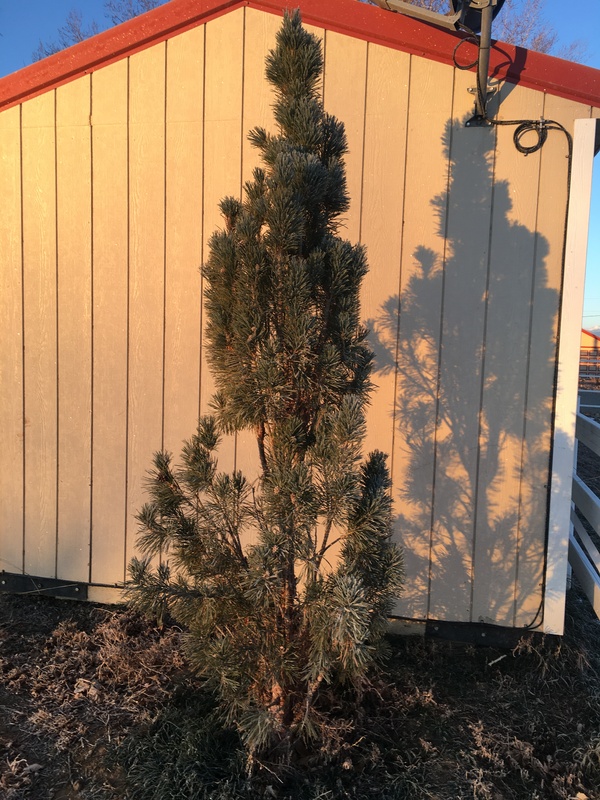 Columnar Scots Pine is the January 2017 Plant of the Month – Glacier View Landscape and Design, Inc.
Scots pine, the standard species, is the only native pine to Northern Europe and is often found mixed with Norway Spruce, and other hardwoods, though there are stands of pure Scots pine in Northern Europe. Scots pine spread from Northern Europe after the last glacial maximum and was finally established in Scotland about 8,500 years ago. It became extinct in the British Isles as the climate warmed about 4,000 years ago and finally extinct in Ireland about 1,500 years ago. It is only found natively now in Scotland and northern Europe. It was introduced in the US in about 1600 and is listed as invasive in Wisconsin and Michigan, though it does not grow well there as forest stands. It has been cultivated for use in the landscape where it thrives both as a standard and as several cultivars, such as ‘Fastigiata’. Uses in the landscape are generally as focal trees in tight spaces on small landscapes, as hedgerows or windbreaks in tight spaces, and as corner pieces to frame buildings, driveways, or entrances. It has a regal upright appearance and provides color and interest throughout the year. It has few pathogens and is rather drought tolerant once established. It will do fine in our particularly clay soils found in the eastern Boulder County areas such as in Louisville Colorado landscapes. It does not like to have its feet continuously wet and will drown in those locals. It likes well drained soil, but can tolerate the clays if they are not soggy and saturated. It prefers full sun. Plant two to frame an entrance for that formal appearance and enjoy them for years to come. Contact Dave to learn about a free consultation and estimate for your local Erie and Boulder, Colorado area landscape project or follow us on Pinterest to see our featured landscaping project photos.